Summary: Researchers shed light on thermoregulation by disabling parts of rat brains and observing their choice of a comfortable environmental temperature. The findings could provide new understanding of conditions such as heatstroke. To maintain the body at an appropriate temperature despite changes in the environment, there are a number of physiological and behavioral responses that can be adopted, such as shivering or moving into or out of direct sunlight. Although these responses are well understood, there is still a lack of understanding of the nerve and brain pathways that control them. 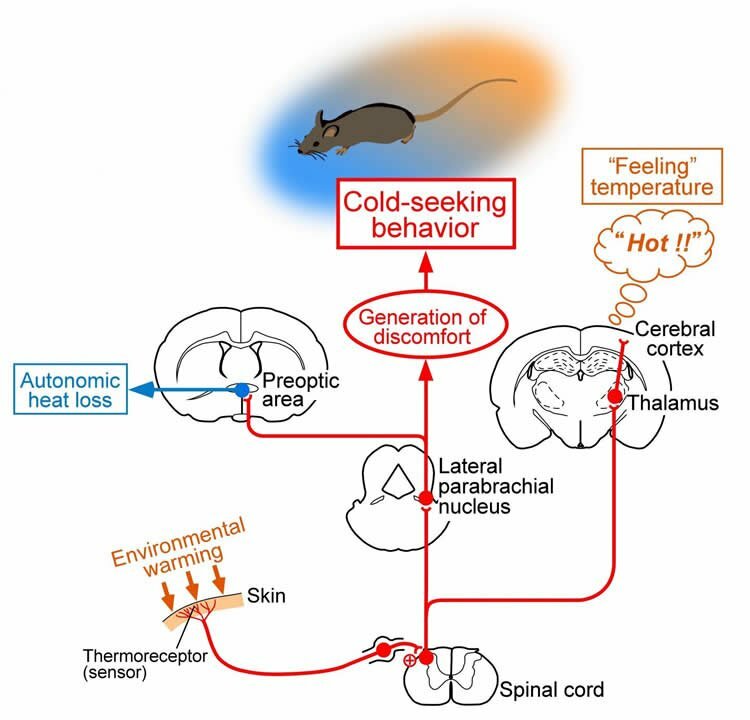 Researchers at the Department of Integrative Physiology at Nagoya University Graduate School of Medicine have boosted our knowledge of sensing external temperature and responding to it to maintain body temperature, known as “thermoregulation,” by disabling parts of the brain in rats and then observing the animals’ choices of a comfortable environmental temperature. The new findings, recently published in Scientific Reports, could also help us understand conditions in which these regulatory systems go awry, such as heatstroke. The team built on earlier studies that suggested the involvement of two brain/neural sensory pathways in thermoregulation, namely, the spinothalamocortical (STC) pathway and the lateral parabrachial nucleus-hypothalamus preoptic area (LPB-POA) pathway. They injected toxic substances into parts of the brain involved in each of these pathways to disable them, and then investigated how this influenced the “feeling” of temperature changes and responses to such changes. However, when part of the LPB pathway was instead disabled by injecting another toxin, the rats no longer tried to avoid the hot and cold plates. Measuring their body temperature also revealed that their brains had warmed up to a hyperthermic state when they had been on a warm plate, showing that the body’s ability to regulate its core temperature had been damaged. The team hopes to build on this work by obtaining detailed findings on the specific groups of neurons involved in the pathways and on the involvement of emotion-related parts of the brain in thermoregulation and the behavior of seeking thermal comfort. Funding: Funding provided by Ministry of Education, Culture, Sports, Science and Technology of Japan, Japan Science and Technology Agency, Hori Science and Art Foundation, Takeda Science Foundation, and others. Image Source: NeuroscienceNews.com image is credited to Kazuhiro Nakamura. Nagoya University “Different Sensory Pathways Engaged in Feeling and Responding to External Temperature.” NeuroscienceNews. NeuroscienceNews, 3 August 2017. Thermoregulatory behaviour, such as migration to a comfortable thermal environment, is a representative innate animal behaviour and facilitates effective autonomic regulation of body temperature with a reduced cost of resources. Here we determine the central thermosensory ascending pathway that transmits information on environmental temperature from cutaneous thermoreceptors to elicit thermoregulatory behaviour. To examine the contribution of the spinothalamocortical pathway, which is known to mediate thermosensory transmission for perception of skin temperature, we lesioned thalamic regions mediating this pathway in rats. Thalamic-lesioned rats showed compromised electroencephalographic responses in the primary somatosensory cortex to changes in skin temperature, indicating functional ablation of the spinothalamocortical pathway. However, these lesioned rats subjected to a two-floor innocuous thermal plate preference test displayed intact heat- and cold-avoidance thermoregulatory behaviours. We then examined the involvement of the lateral parabrachial nucleus (LPB), which mediates cutaneous thermosensory signaling to the thermoregulatory center for autonomic thermoregulation. Inactivation of neurons in the LPB eliminated both heat- and cold-avoidance thermoregulatory behaviours and ablated heat defense. These results demonstrate that the LPB, but not the thalamus, mediates the cutaneous thermosensory neural signaling required for behavioural thermoregulation, contributing to understanding of the central circuit that generates thermal comfort and discomfort underlying thermoregulatory behaviours.